Natural gas is a major source of energy and one of the least polluting fuel. It is mainly composed by methane, the simplest hydrocarbon molecule, which gives the natural gas significant advantages in safety and emissions against other fossil fuels. Liquefied natural gas or LNG, is natural gas that has been converted to a liquid form for the ease of storage or transport, by cooling natural gas to approximately −162 °C. LNG is odourless, colourless, non-toxic and non-corrosive. 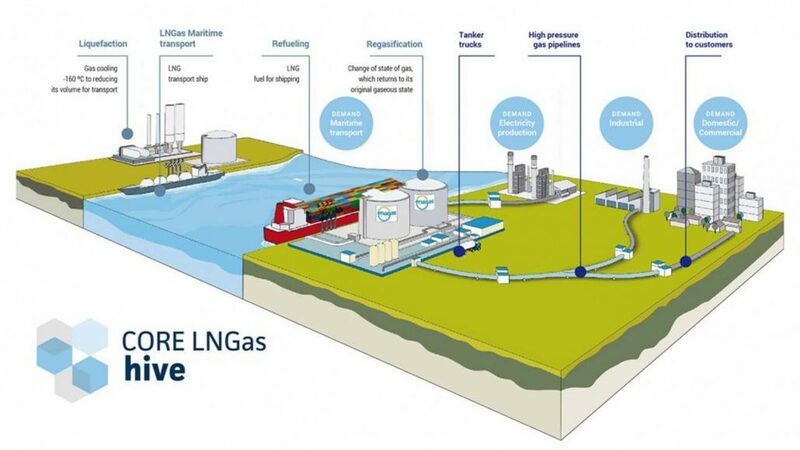 Natural gas is converted into LNG in liquefaction plants from where it is transported to LNG terminals, then regasified and introduced into pipelines for its delivery to the final consumer (industrial, domestic or power plants mainly). This is the traditional chain for LNG. LNG applications as a final product are becoming more and more popular. Among these other uses, LNG has a huge potential as a down-to-Earth alternative fuel to oil in transportation sector, giving it the opportunity to reduce its emissions, to diversify its energy mix and to reduce its costs. LNG contributes to a low-carbon economy. LNG is the fuel of the future.